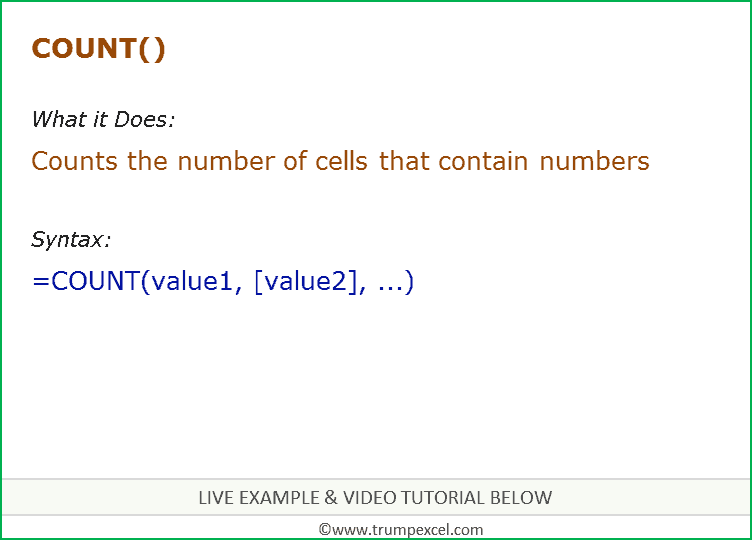 COUNT function can be used to count the number of cells that contain numbers. It returns a number that represents the number of cells that contain numbers. value1 – the first item, cell reference, or range within which you want to count numbers. [value2], … – (optional) up to 255 additional items, cell references, or ranges within which you want to count numbers. Dates and text representation of numbers (such as 1 in double quotes – “1”) are counted. Logical Values (TRUE/FALSE) typed directly into the formula are counted.